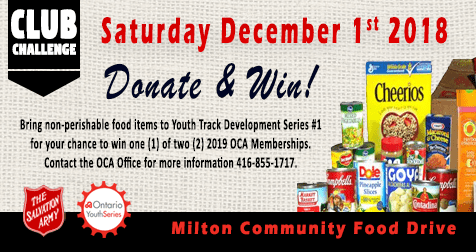 The OCA will be collecting items at the registration desk on behalf of the Milton Community Food Drive on Saturday, December 1st and Sunday, December 2nd, 2018 at the Youth Track Development Series and Track Ontario Cup events. Preferred items to be donated include non-perishable foods, household cleaning products, toiletries, and baby items. Items such as peanut butter, cereal, crackers, cookies, etc. are always in need. The Milton Community Food Drive serves approximately 600 people at the food bank and with a consistent increase in new clients, a much greater number of clients served is anticipated. Donated items are received by citizens of Milton/Campbellville who live at or below the poverty line. CLUB CHALLENGE – Donate & Win! The OCA is issuing a club challenge to all clubs attending the Youth Track Development Series #1! Clubs are encouraged to bring non-perishable food items for a chance to win one (1) of two (2) 2019 OCA Memberships. The OCA will be giving away two (2) free 2019 memberships to the club who brings the most non-perishable food items on Saturday December 1st. The first membership will be given to the club that brings the most items (membership can be given to the athlete in the club with the largest donation). The second membership will be given to the independent rider that brings the most items. Winners will be given a coupon code to redeem their 2019 license. Prizes do not have a cash value and are non-transferable. For more information on the club challenge, please contact the OCA Office at 416-855-1717.